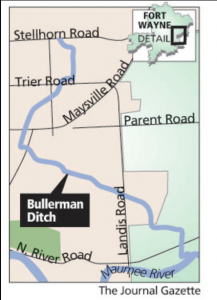 Few have probably heard of the Bullerman Ditch, which has its origins near the corner of Lahmeyer and Stellhorn roads in northeast Fort Wayne. From there, it winds south for about 3 miles through urbanized development and a bit of agricultural land before it drains into the Maumee River at North River Road. 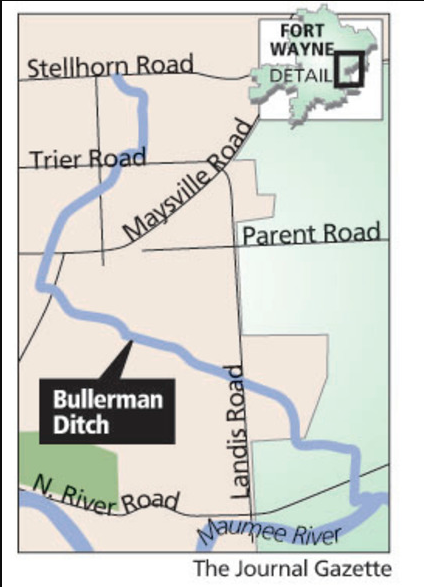 With a conference on an Upper Maumee Watershed environmental implementation plan scheduled for Jan. 24, Save Maumee Grassroots Organization’s founder Abigail King has initiated a campaign to highlight the importance of the Bullerman Ditch. 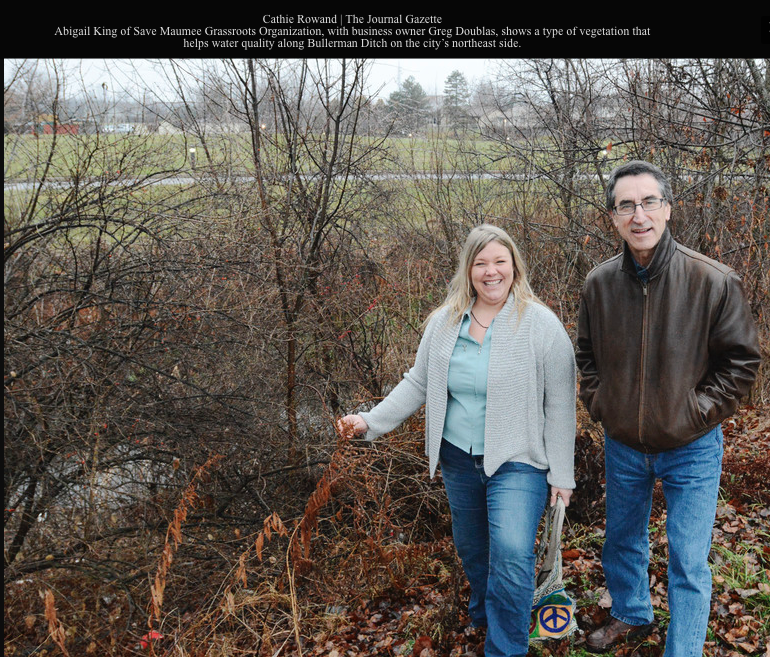 In an effort to intensify preservation or revitalization of the tributary in the urbanized areas, Save Maumee has written an amusing letter, thanking business owners for their efforts to improve the ditch while begging them to consider planting native trees and other flora and to not mow or use pesticides, herbicides or fertilizers. “So many times we love to point out what somebody’s doing wrong,” King said. This letter is an encouraging one. The Maumee River is the largest tributary in the Great Lakes region, directly flowing into Lake Erie, Jones said. The Maumee has taken on more importance as environmentalists and local officials grapple with the reality that drinking water cannot be taken for granted after 500,000 people in Toledo last summer went 21/2 days without potable water. Toledo, perched on Lake Erie, is in the same Upper Maumee River watershed as Fort Wayne, the river’s point of origin. But before local agencies can apply for federal aid from the Environmental Protection Agency, a watershed management plan must be implemented, King says. That implementation will be the topic at the Jan. 24 conference held at Indiana Tech Law School and sponsored by Save Maumee. Along with organizations such as the Allen County Partnership and the Allen County Soil and Water Conservation District, both quasi-governmental agencies, the public is invited to the conference, King said. Another conference with local and regional watershed organizations and the EPA is tentatively scheduled for April 8, 9 and 11 at Grand Wayne Center, Jones added. It is sponsored by the Tri-State Watershed Alliance. Greg Doublas, owner of a shopping strip in the 2700 block of Maplecrest Road, said he enjoyed getting the letter because it was positive. “We stay away from the ditch,” Doublas said. “We don’t mess around it. You know, we are doing the best we can to keep it clean.” But, he added, he wasn’t aware of it either. That said, he is keeping on eye on any tenants who dump in a grate at the low end of the parking lot. Anything poured in the grate also makes its way to the stream and eventually to the river, Jones said. The ditch is “bombarded by lots of excess fertilizer, hobby farms with goats, chickens and definitely horses, anything that is leaking off driveways or parking lots and also any amount of pet waste (from pets) that live on the lawns, that live in the watershed,” Jones said. The algae blooms that appeared last summer in Toledo’s drinking water were the result mostly of excess fertilizer but also of “suburbs and environments where people just don’t care, and broken-down septic systems,” Jones said. In fact, 68 percent of the Upper Maumee is agricultural, but the EPA already has an outreach to farmers, King said. That’s why Save Maumee will be kindly and gently targeting the suburban and urban pollution. While Lake Erie may be the drinking water source for Toledo, most of the drinking water for the 350,000 people in the Upper Maumee watershed comes from the Maumee River, Jones said. The watershed spans 392 square miles with 434 miles of constantly running streams within its boundaries. Fort Wayne’s drinking water comes primarily from the St. Joseph River before it goes into the Maumee, Jones said, which makes environmental watershed plans for both the St. Joe and St. Marys rivers critical to the health of the Maumee. 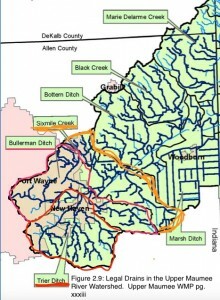 Part of Fort Wayne lies in the Upper Maumee watershed. Besides asking Bullerman Ditch denizens to stop mowing, plant native plants and curb the use of fertilizer, pesticides and herbicides, King wants them to read the labels of any product going anywhere near the ditch and consider something else. “Retention ponds, rain barrels and rain gardens,” she says cheerfully. For more information, contact Save Maumee at www.savemaumee.org. Bullerman Ditch is the creek running right through your property! A sincere and warm thank you for not removing the trees and plants that grow next to your stream! Did you know the water behind your building is a valuable asset! We care, because it runs right into the Maumee River. Save Maumee Grassroots Organization Inc. goal is to implement the Upper Maumee Watershed Management Plan. Definitely DO NOT SPRAY pesticides and herbicides or especially fertilizer near the water, so it does not slowly drain into the already impaired Maumee River….and save some money. Plant some more native plants next to your creek…they already grow there now! We are making this call to action for all people who own land directly next to urban area streams, which flow into the Maumee River. You are a true example to follow. 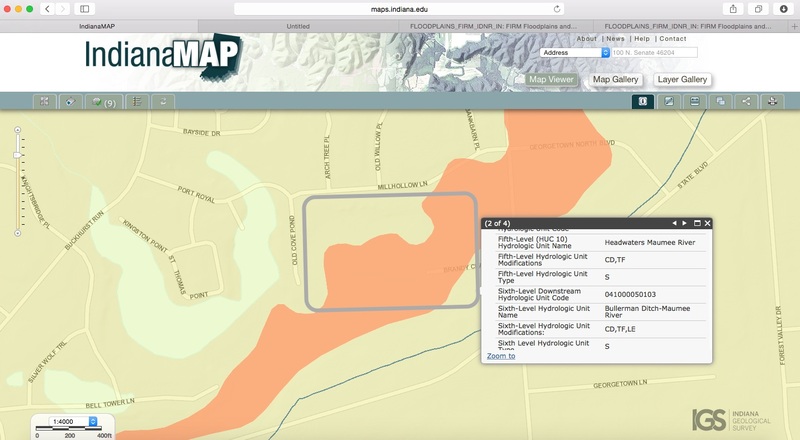 SMGO would like to provide consulting services free-of-charge regarding water quality and species of plants, animals and trees lie next to your creek. We have suggestions for improvements beyond a short thank you note! North of State Street, West of Maplecrest Rd. The drinking water crisis in Toledo has brought our water quality issues into a national spotlight. Local, state, federal government, and non-profit groups and agencies across Indiana and Ohio are working together to find a solution. 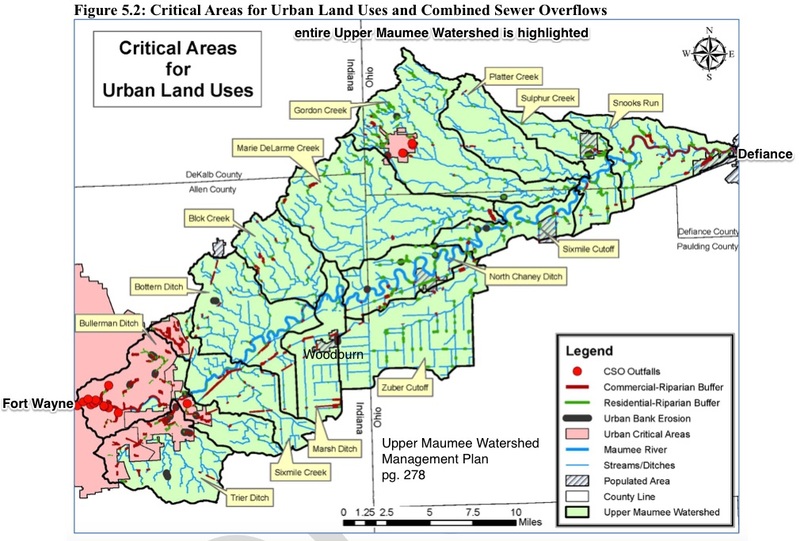 The Allen County Soil & Water Conservation District (SWCD) in Indiana and the Defiance County SWCD in Ohio, in-conjunction with a diverse contingency of community groups and non-profits, are pleased to prepare for the release of the Upper Maumee Watershed Management Plan (UMWMP). The Maumee is the largest Great Lakes Watershed. 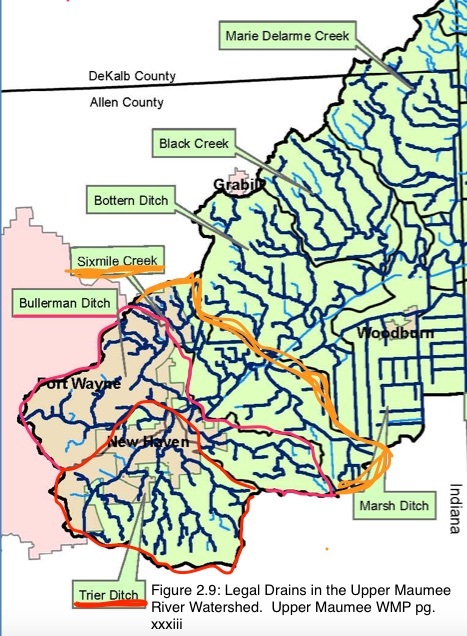 The Upper Maumee Watershed alone drains 430 miles of tributary perennial streams. The Maumee River begins at the confluence of the St. Joe and St. Mary’s rivers in Fort Wayne, travels through northeast Indiana & northwest Ohio, and outlets into Lake Erie. 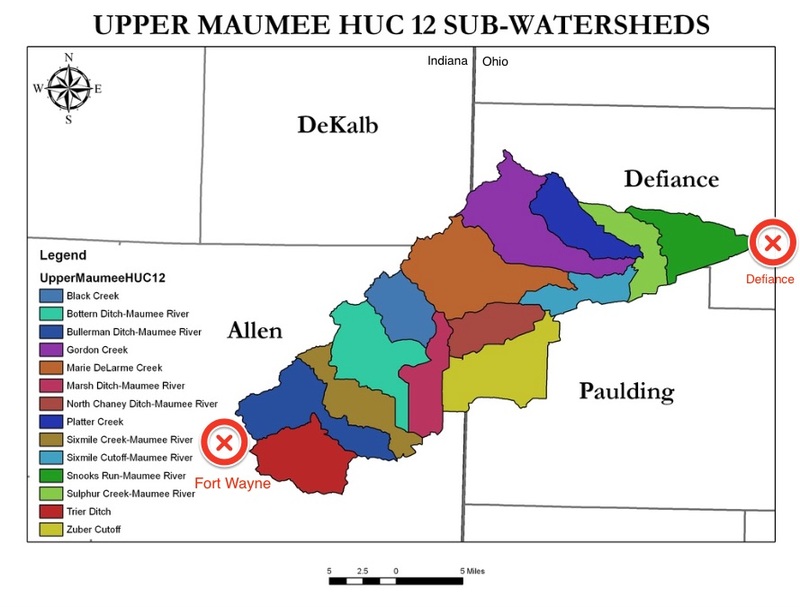 To date, there has never been a watershed plan that specifically focused on the Upper Maumee, which is a major source of sediment and nutrients feeding the growing hypoxic zone in the Western Lake Erie Basin. We are pleased to be a part of the first steps toward reclamation of our most valuable freshwater resources. We are inviting and hosting people like you, along with agencies, non-profits, tribes and other stakeholders of Indiana and Ohio to help implement the Plan that was released in final form in December 2014. Supporters are encouraged to register for the Implementation Conference, so you know how you can help improve water quality. Thank you for your interest in supporting the health and vitality of the Maumee River, and benefit of the entire Great Lakes Watershed. We look forward to working with all of you. Save Maumee Grassroots Organization Inc.
Urban area where Save Maumee and others will focus on urban issues that threaten water quality. 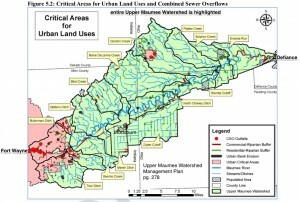 Critical Areas for Urban Land Uses and Combined Sewer Overflows.